When it comes to live or social music pleasures, the quality of the venue is often paramount. Is the sound good? How’s the lighting? The staff? But, above all, how’s the atmosphere? This quality can make or break a space—believe us, we know. We’ve been all over the world in a variety of different spaces. But this isn’t about us, it’s about you and where you love to go to hear music and bands you love. Apparently, where you love to go is on a boat—at least if you live in Budapest. 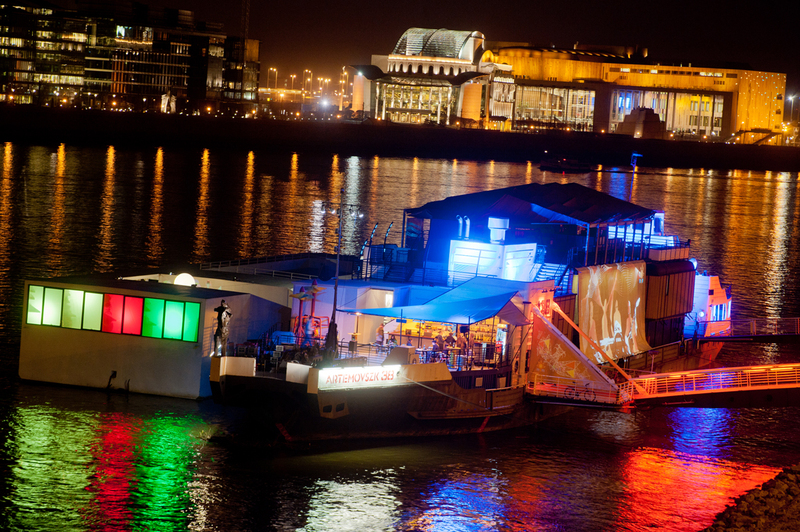 The floating venue A38 has quite a few fans, and as a result it topped our poll as your first choice for partying. In second place was Berlin’s famous Berghain, of which much has been already written… Odds are that if you’ve ever visited the German capital city, you’ve payed a visit into the huge ravespace, hovering around the booming Funktion-One speakers, and got up to all sorts of illicit fun around the bathrooms. Perhaps you wandered over to the smaller Kantine, where a host of fantastic live show regularly take place—we ourselves saw quite a few this year, including Chelsea Wolfe and Purity Ring. Whatever you did, it was most likely fun—unless it involved one of the notoriously long lines to get in. Third place goes to one of New York City’s longest-running DIY venues, The Silent Barn. The rough-n-ready space saw quite a few problems last year after being raided by police (due to it also being a home for the artists who worked there), vandalized, and robbed. However, they’ve recently relocated from their former home in Ridgewood, Queens to the more centralized Bushwick. The new space is properly zoned for living and commercial use, so we’re hoping this means a beautiful 2013 for a beautiful project. Yet another Hungarian space comes in fourth, the Millenáris Teátrum—which leads us to wonder: do we have a ton of Budapest readers or what? Or maybe you just have very fond memories of our 2012 Budapest EB festival? Whatever the case, köszönöm! Tagging behind the Teátrum is another DIY space, again located in Berlin. Raum, the series of warehouse-based spaces that operated in the rising artist’s quarter of Neukölln, hosted some of the year’s wildest and heaviest parties from some of the weirdest locals, including Sameheads, PURGE, and Noisekölln. If you were an ex-pat, weirdo or just in need of something different, you probably showed up here at least once in 2012. The 7th prize—a premium Spotify account—goes to Lukas Nickel, Münster, Germany. Your favorite music video of 2012 will be following on Wednesday, December 26th. Find all poll results in here.